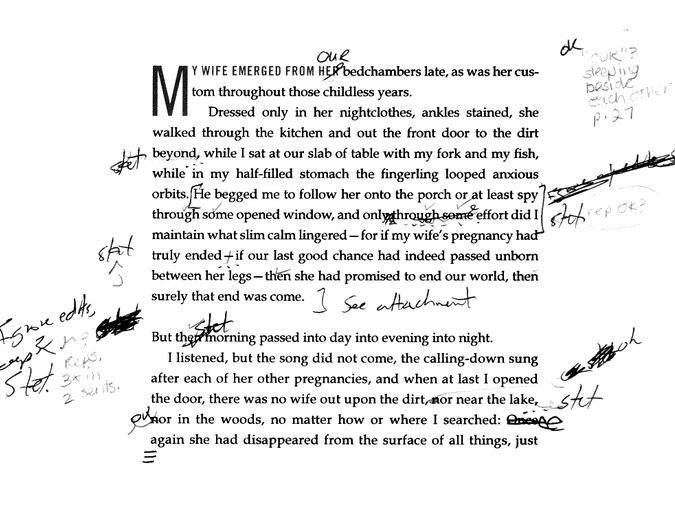 Note: Below is the style sheet for my novel In the House upon the Dirt between the Lake and the Woods, prepared by my fantastic copyeditor, Susan Bradanini Betz. While her marked pages were making their way to me through the mail, my editor Mark Doten at Soho sent ahead a series of files Betz had prepared as part of the process, including the following word list and general style guide. (There were two other documents we've decided not to share here, because they contain spoilers—one on the characters and one on the chronology.) Combined with Betz's incredibly helpful notes on my pages, these documents offered me a look into the novel that I'd never expected, an abstract sort of summary or outline in lists, and another way to see the stylistic choices I'd made—and, of course, the mistakes. ...my voice saying no. WATCH! had fit through any of the openings leading below, then surely we would have seen her there. Matt Bell's debut novel In the House upon the Dirt between the Lake and the Woods was published in June 2013 by Soho Press. He is also the author of two previous books, How They Were Found andCataclysm Baby. His writing has been anthologized in Best American Mysteries 2010, Best American Fantasy 2, and 30 Under 30: An Anthology of Innovative Fiction by Younger Writers. He teaches creative writing at Northern Michigan University.